New Zealand was 1-0 up in the series, coming into Christchurch and scars from the last match were still wide open. West Indies bitterly complained about the standard of umpiring in the previous match, with Umpire Fred Goodall being main accused. Also, most of them were away from home for a long time, following a long, grueling tour in Australia. The bitter, cold weather just added to their woes. On the face of adversaries, West Indies players started complaining, just about regarding everything. This prompted a local radio station to come up with a satirical calypso – after Simon & Garfunkel song 'Cecilia'. It went like, 'Mr. Goodall, you’re breaking our hearts, you ain’t seeing straight and we‘re losing'. and, so on. It was on everybody’s lips and started playing on the psyche of the West Indies team. West Indies batted first and batted poorly. Hadlee and Cairns quickly reduced them to 28 for 3. Greenidge (91) and Kallicharran (75) rescued them to a certain extent with 162 runs partnership. But, once they fell on the same score, rest of the batting capitulated against Lance Cairns (6 for 85). West Indies lost their last 7 wickets for just 38 runs, to be all out for 228. However, much part of the first and second day’s play was marred due to bad weather and New Zealand could start their innings only towards the end of second day’s play. Third day’s play would be one of the sordid days of history in cricket. New Zealand lost some early wickets. But, Geoff Howarth and John Parker steadied them. However, when Howarth was on 66, he clearly gloved a short ball to the keeper. He would admit it later that everybody behind the wicket and himself knew about it. But, the umpire saw nothing. That was the last straw that broke the camel’s back. West Indies team did not come out of the pavilion after tea. Some official went to their dressing room to inform that the umpires are already out. They got a response from Clive Lloyd, 'That’s fine, but we are not going back'. That triggered frenzied actions and Walter Hadlee (father of Richard Hadlee), who was chairman of New Zealand Board, rushed to meet Lloyd. There were some hectic negotiations between the captains and him. It was decided that if any player from either team knew that he had been out, he should walk away. West Indies demanded that Fred Goodall had to be replaced then and there. The reluctant West Indies team took the field after 12 minutes of scheduled time and there were some more questionable decisions. In protest, they bowled with short run-ups, bowled mostly short-pitch balls, left the balls for easy boundaries and dropped catches. Sadly, it was just not cricket any more. The next day was a rest day and West Indies dressing rooms were already cleaned up by the players in anticipation of the tour being cancelled and them going home. Jeff Stollmeyer, president of WICB, was contacted in the Caribbean immediately. He assured that, 'It won’t happen'. The rest day was spent in negotiations between two boards and West Indies players. Finally, the players decided to continue after an internal voting. On fourth day, things became worse. The gentleman’s agreement of walking did not really get reflected on the ground. 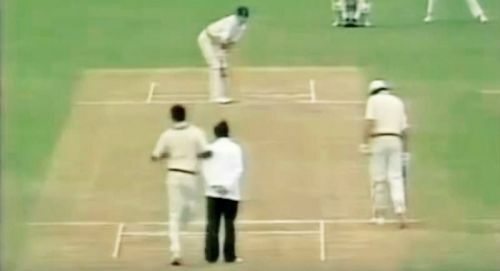 Richard Hadlee tried to swat a bouncer from Colin Croft, got an edge and was given not out. Again, Fred Goodall did not hear the nick. Hadlee would tell him later that there was an edge. Croft was already having a verbal spat with the umpire on calling repeated 'No balls' to go beyond return crease. Fred Goodall was a School teacher by profession and, apparently, Croft used a four-letter word and asked him to go back to teaching. Goodall and the other umpire walked down to the West Indies captain, who was fielding in the slip and had a word with him. Clive Lloyd did not take a single step to come forward and meet them, neither did he say anything to Croft. The next ball was again called a no ball. Fuming Croft while returning, flicked the bails in front of Goodall. The non-striker Jeremy Coney put the bails back. In The next ball, Croft came very close to the umpire and his extended elbow hit the umpire in the back. 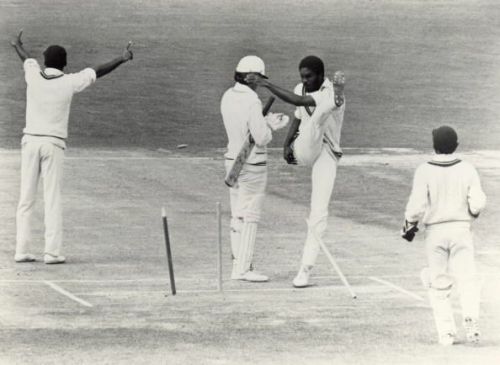 Goodall was startled – holding his paining hand and back, he again walked to Clive Lloyd, who again simply did not move from his position. Goodall mentioned to Clive that he had never been physically attacked in a cricket field and he would report this in his match report. He requested him to remove Croft from the attack. Again, no action was taken. Croft continued to bowl the next over, bowling repeated bouncers and conceding 15 runs in the next over. Till date, Croft maintains that the collision was purely accidental. He went to the extent saying, 'I am six feet six inches and 230 pounds. If I’d meant to hit him, he wouldn’t have got up'. However, the damage was already done to the game. West Indies gave away easy runs and mentally was just not there. Richard Hadlee scored his first Test hundred in the process (103 from 92 balls). But, he himself would later comment that the satisfaction was not there as the opponent team just stopped competing. Three players from West Indies (Hayness, Rowe and Collis King) would score centuries in the second innings and Greenidge scored his second ninety of the match – as the game drifted to a draw. The match would have ramifications much beyond the series and the result. Probably, some of these matches eventually created background of neutral umpires being used. Also, in many of these cases, the local umpires would not be professional and did not have necessary exposure for international matches. Umpiring, like every other facet of the game, needed to be learnt through experience. Fred Goodall and some of the other umpires were not just exposed to this level of cricket. While recollecting the incidents, Clive Lloyd would comment that these umpires were just not competent to officiate and West Indies suffered due to them. 'Will you have incompetent officials in Wimbledon? ', he asked. But, at the same breath, the West Indies skipper was candid to admit that the way he and his team handled the situation and protesting part, was not right. As Richard Hadlee mentioned, 'As professional cricketers and leaders, we have an obligation to the game'. In his illustrious career as a wonderful leader, Lloyd probably could have handled this better.